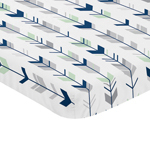 Beyond Bedding now offers an exclusive collection of baby sheet sets, combining stylish designer patterns with top quality fabric. Your little one will sleep peacefully every night in these luxurious designer sheets. Choose from a selection of amazingly affordable unique patterns by Sweet Jojo Designs. 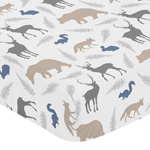 These baby sheet sets will coordinate perfectly with any of the matching crib bedding sets by Sweet Jojo Designs. Extremely soft yet resilient, our sheets are durable enough to withstand the most powerful washing machines time after time. Every time you do the laundry our sheets will be sure to come out of the dryer perfectly smooth and ready for your bundle of joy to have another restful nights sleeps in their cozy bedding sheets.